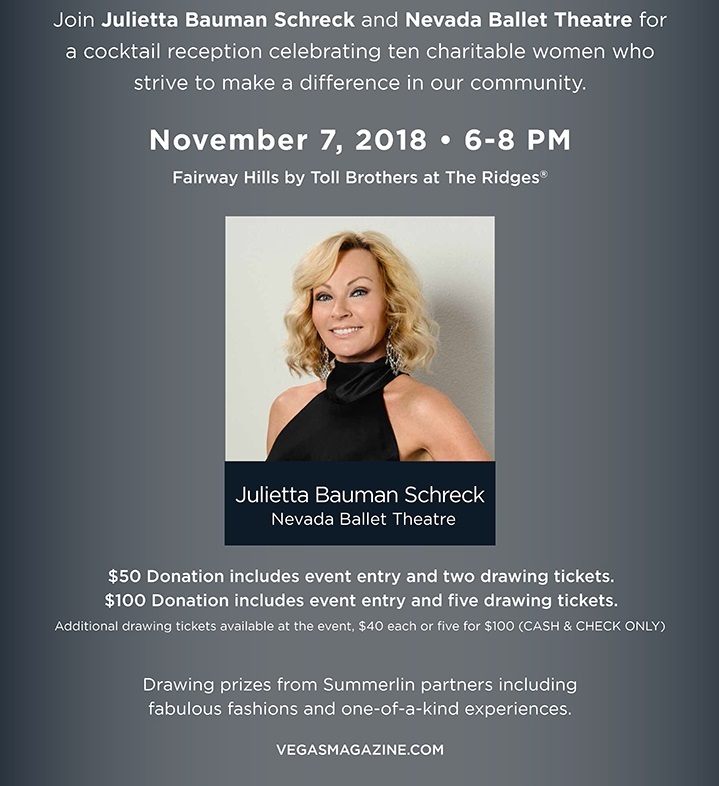 Vegas Gives and NBT are honoring me on November 7th. I am so thankful to be listed among this year's list of amazing philanthropic women. As an NBT Board Member, I want to continue to see our audiences grow for our professional productions at The Smith Center; and I want potential funders to understand that investing in this art form elevates the entire community including our youth, who without some of NBT's outreach programs, would never have the opportunity to experience the joy and beauty of dance. "I truly believe in the transformative power of dance. This amazing art form has the unique ability to transport us to another time and place-while reminding us that joy and beauty still exist in our world. Did you know that in addition to its Professional Company of dancers and affiliated Academy of students, Nevada Ballet Theatre (NBT) works tirelessly to bring that same beauty and joy to the young and underserved of this community? An essential part of NBT's mission is giving the gift of dance FREE of charge to children who would never receive the chance to dance. Through its acclaimed Future Dance Program, hundreds of students are finding happiness in movement and self-expression while developing healthy habits and a strong work ethic. In fact, over 20,000 students a year benefit from NBT's many outreach initiatives. This is the grassroots work that exists behind a world-class stage filled with talented athletes. The arts infuse our community with wonder and vitality, and develop children who are strong, self-assured and well-rounded. Please join me in supporting this important cultural institution so that together we can inspire future generations." Now in its 47th season, Nevada Ballet Theatre is a 501(c)(3) non-profit organization based in Las Vegas and the largest professional ballet company and dance Academy in the state. Committed to the highest artistic standards, this classically-based company is at home in an eclectic repertory, moving easily from the classics to the high-energy contemporary ballets. The mission of Nevada Ballet Theatre is to educate and inspire statewide, regional and national audiences and vitally impact community life through professional company productions, dance training and education and outreach. Nevada Ballet Theatre is the Resident Ballet Company of The Smith Center for the Performing Arts. For more information, visit NBT on the web: www.nevadaballet.org; Like NBT on Facebook: www.facebook.com/NevadaBalletTheatre or Tweet: @NVBallet.